The Epiphone Wilshire was released in 1960 at a time when the newly relocated Epiphone company was starting to get back on its feet. In 1957, on the suggestion of Les Paul, Gibson’s legendary Vice President and designer Ted McCarty bought the struggling Epiphone Instrument Company and brought the tooling and original designs back to the Gibson factory in Kalamazoo, Michigan. 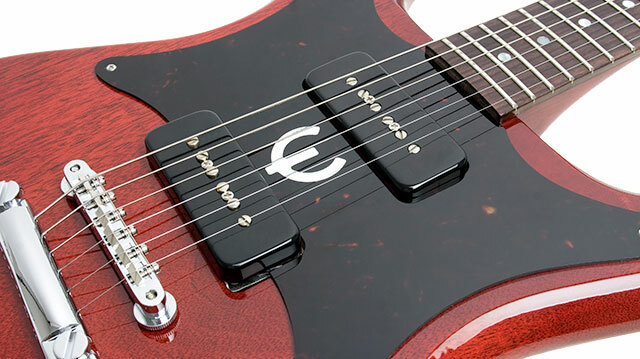 McCarty charged Epiphone’s designers with the task of remaking the company with new models while retaining the key archtops that had made Epiphone world famous (and had given Gibson the best competition they have had!). Gibson began production of a new line of "Kalamazoo-made and designed" Epiphones in 1959. Over the next decade from 1959 through early 1970, Epiphone guitars and basses were produced in limited numbers along side Gibson instruments. The Kalamazoo factory produced some of the highest quality and best sounding instruments in rock history during those years. But Epiphone instruments made in Kalamazoo had unique shapes, pickup arrangements, and tonal signatures not found on comparable Gibson models of the day. Though under-appreciated by the general public at the time of their release, numerous artists through the years have recognized the unique appeal and value of Kalamazoo-made Epiphones. In 1960, just as Gibson had moved away from the traditional Les Paul model to the SG, Epiphone released their own solid body, the Wilshire, which became a favorite of Jimi Hendrix, Johnny Winter, Paul Gilbert and Steve Marriot and many others who embraced the excellent tone and build quality. The 1962 Wilshire featured two P-90 pickups, a 3-on a side headstock, and a solid mahogany body with 1-piece neck. The Wilshire, designed to compete with the popular Stratocaster, had terrific upper fret access, was light-weight and had low action. With an original sticker price of $210, production of the 1962 Wilshire SB-432 was limited to only 180 guitars. Today, owners of an original 1962 Wilshire are not only blessed with an outstanding instrument, but also a wise investment and a very collectible guitar. An original Wilshire now sells for $5,000 to $12,000 or more depending upon condition. To commemorate the Wilshire as well as other "Kalamazoo-made' models, Epiphone is proud to introduce the Epiphone Historic Custom USA collection. The first in the series of reissues is the 1962 Wilshire in Cherry. Made in Nashville, Tennessee in cooperation with the Gibson Custom Shop and limited to only 100 instruments worldwide, it combines impeccable attention to detail and historic accuracy. The 1962 Wilshire features a 1-piece Peruvian mahogany body and a 1-piece Peruvian mahogany neck, hand-set and glued for security. The Madagascar rosewood fretboard with pearloid dot inlays has a 24-3/4" scale and a 1.68” nut with the classic 12” radius and 22 medium jumbo frets. The 1962 Wilshire features two "soapbar" P-90's with adjustable pole pieces on an authentic unit base with 1960's construction. The P-90s were a favorite of archtop jazz players like Barney Kessel for their distinctive woody tone. But P-90s really found their home in solid body guitars and are still favored today by players who prefer more articulation than a humbucker but without the quack. The 1962 Wilshire uses a modern and extremely stable ABR-1 Tune-o-Matic bridge with an aluminum StopBar tailpiece and an imitation tortoise style pickguard with foil "E" logo. Controls include volume and tone for each pickup and a 3-way selector switch with CTS potentiometers from Switchcraft™, and vintage style Kluson™ tuners with plastic buttons. 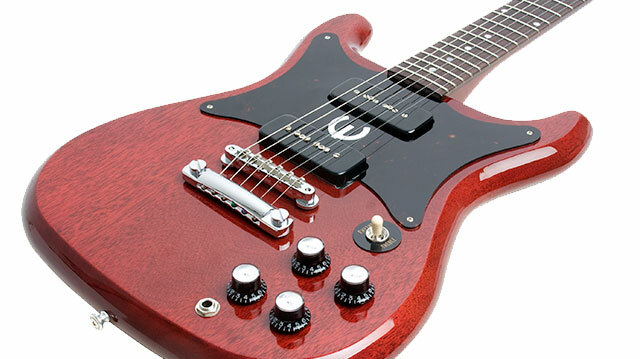 And just like the original, the 1962 Wilshire is made at Epiphone USA in beautiful Cherry color finish.